With the help of Flash Optimizer any SWF file can be easily compressed without quality loss. The fact is that Flash Optimizer uses top-notch algorithms of vectors, shapes, morphing, Z-buffer, fonts and other optimizations to make SWF files load faster while preserving their quality. Moreover, with our tool you can tune up the compression settings to optimize the definite part of your SWF movie, or the whole file itself. All relevant Flash versions, including Flash CS6, as well as ActionScript 2 and 3 are fully supported. 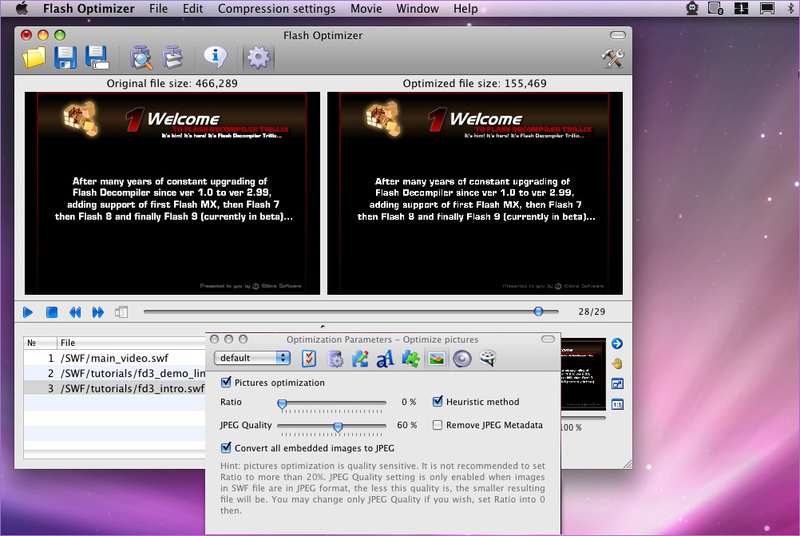 Flash Optimizer for Mac OS offers total control over each optimization parameter. You can choose one of the default optimization settings and see whether it suits your needs. However, you can customize these settings manually to reach the most effective optimization ratio. You can also save the settings you like best for future use. You can preview and analyze compression settings before optimizing the movie. 2-player window with zoom in/out option will clearly show you the differences between the original and optimized-to-be files. User-friendly and customizable interface will help you get around Flash Optimizer in seconds.